Slow Art Day has asked its 2013 college interns to write short summaries of their own experiences looking slowly at artworks of their choosing. Amanda Kegu, Slow Art Day intern from the University of Florida, writes here about her experience seeing the unexpected. Viewing art slowly is not one of my normal habits at art museums. My first instinct, like many other art history nerds, is to beeline to the contemporary wing to gape in awe at a huge Jackson Pollock or to sit in a dark room for a few seconds watching a video installation before dashing to the next item. My usual goal is to see as many famous works of art at once to claim I’ve seen them in person. This is how usually I decide (1) the quality of the museum and (2) how well informed I am as an art historian. 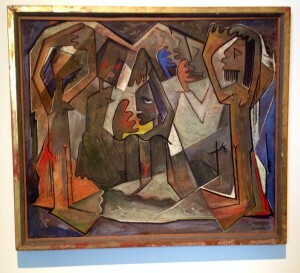 However, just because a museum has a dozen Picassos and I’ve seen them all in under five minutes does not make that a great museum or make me a better viewer. If I really look back to my time spent in museums, most of it was spent moving from exhibition to exhibition wondering what was around the corner. I can appreciate the qualities, the skills, and the context of the works, but I view these works of art like they’re celebrities, there to be ticked off on my list of things to see in my lifetime. Since joining the Slow Art Day team as an intern, I have come to understand the importance of looking at works slowly to truly appreciate them. I recently visited the Harn Museum of Art on the University of Florida campus to see their new contemporary exhibit (clearly, I’m a fan of today’s artists). I have interned there for two semesters and have been a Gallery Guide before, so I am very familiar with the works on display. But I wondered how my perspective has changed since becoming involved with Slow Art Day, so I decided to slowly look at one of my favorite pieces in the Modern collection, El Encuentro by Angel Botello. Angel Botello (1913-1986) was a Spanish born artist known as the “Caribbean Ganguin” because of his distinct expressionistic style and use of colors. El Encuentro (1950) depicts the “encounter” between the natives of Haiti and Christopher Columbus. 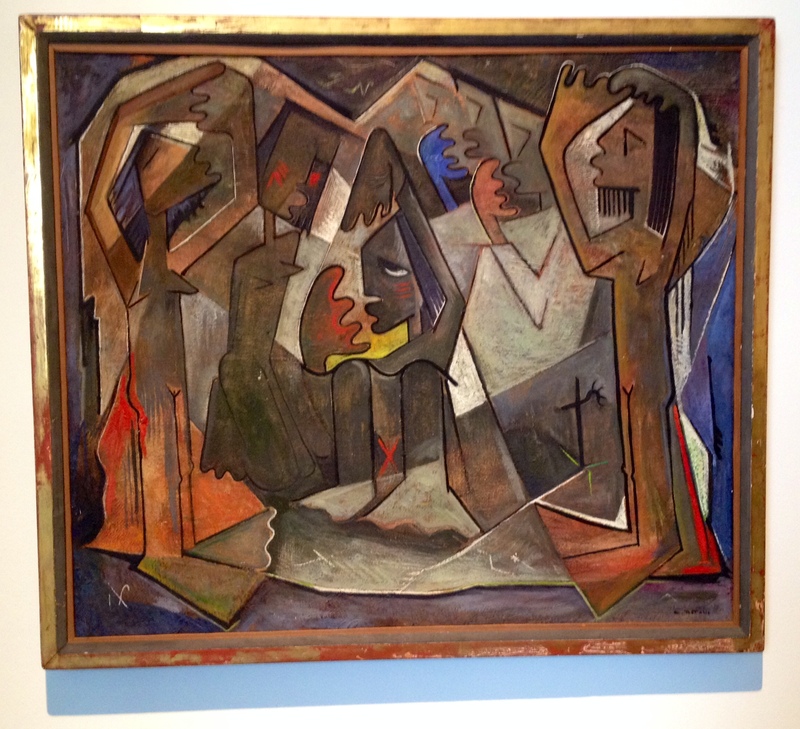 The abstracted figures stand and sit against a geometric background. Each figure has flattened, triangular feet and morphed hands with only four fingers. Behind the two largest figures in the front, hands raise in the background from unseen bodies. All the figures hands mimic each other, grabbing towards each other for some reason. Botello used warm and cool colors to contrast the neutral colors in the background and to highlight the emotions of the natives as they encounter a foreign person. He skillfully fit all the figures into geometric shapes, and the touches of lines all echo the energy of the people. Their hands reach up towards the sky as though they were searching for an answer from above and the geometric background representing chaos and confusion heightens the emotions of the scene. Standing there looking at this for seven minutes gave me the chance to see the little details that Botello included. Every line, color, and mark that Botello used was to capture the energy of the natives that he lived amongst and tell the tale of the people he was a part of. Looking at their faces, I felt I could understand their confusion and distress when Columbus, a complete stranger that looks much different from their own people, appears almost magically from the ocean. It seemed so long ago today, but the impact of that moment was profound for Haiti. Slowly appreciating Botello’s quality of line, color, and shape made me understand his personal goal to capture his ancestors’ emotional state at this moment in time. Had I quickly glanced at this piece without stopping to look slowly, I would not have been able to fully understand what Botello was attempting to convey with his work of art. This experience has made me realize that my method of viewing art in museums is not the most effective way. I might be the most efficient viewer in a museum, but seeing 10 works of art means nothing if I can’t recall the qualities of it. Its hard to describe the difference in the slow approach to looking, so here’s my advice: take a minute (or seven), slow down, and really take a look at art. Its amazing what you can see when you’re actually looking, especially when you don’t know what you’re looking for. Angel Botello’s El Encuentro among other great works is available to view at the Harn Museum of Art in Gainesville, FL. Sign up to participate in the Harn Museum’s Slow Art Day event here.